Vandals smash monument to fallen Paratroopers who liberated Sheikh Jarrah neighborhood. City and Defense Ministry mobilize for quick repair. A monument to fallen IDF soldiers who liberated the neighborhood of Sheikh Jarrah, one of the paratroop fighter's brigades, was vandalized earlier this week by Arab rioters from the neighborhood. 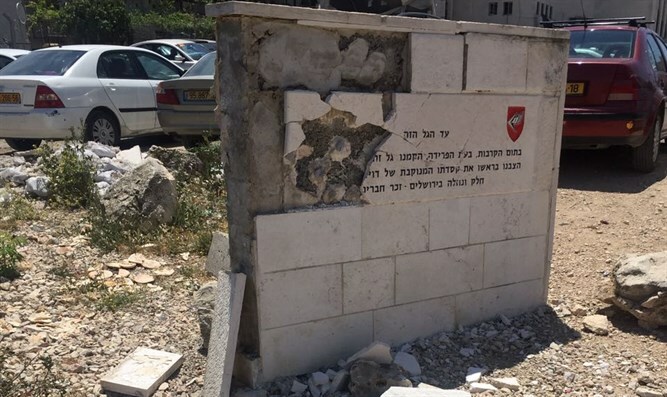 In an interview with Arutz Sheva, City Councilman Aryeh King spoke of the destruction and the rapid response to his request directed to the municipality and Defense Ministry to repair the monument. The vandalism was discovered by visitors to Shimon Hatzadik's grave when they went to the early morning vatikin prayer: "They saw several plates broken, especially a new memorial plaque that was placed a month ago to commemorate fifty years," says King, noting that on Sunday afternoon he received additional reports from residents about the vandalism. "We approached the police, the municipality and the Defense Ministry, and municipality employees will arrive in the next few hours to repair the monument," says King. "They must be given proper credit. There was a quick response from both the Jerusalem Municipality director general and the defense minister's bureau, and each took on the task. In addition, members of the Paratroopers Heritage Foundation decided to take part in the renovation at their expense, even though it should not be at their expense. By tomorrow, at 4 PM, when the bereaved families and the brigade soldiers arrive, the monument will already be repaired." King notes that "there are several other monuments in the east of the city, in Armon Hanatziv, Ramat Rahel, Sheikh Jarrah, Mount of Olives, etc." and in view of this fact, a comprehensive and inclusive response is needed to prevent this phenomenon. I talked to the station chief of these areas. He understands the timing the terrorists chose to carry out the act with the monuments. The police will increase their presence, and yesterday police presence has already been reinforced. Maybe they will put cameras that will not cover only the monument, but the path of the road." Whether the families will avoid tomorrow's memorial service for fear of attack, King is convinced there is no such problem. "I'll tell you a personal story: Three years ago, during the preparations, an hour or two before the ceremony at Shimon Hatzadik, left-wing activists demonstrated at the junction of Wadi Joz. Paratroop veterans came out against the left-wing demonstrators and it came to the point of blows, so I'm not worried. Beyond that there will be a police presence, the place is fenced, and the ceremony is secure." King calls on the general public to come to the site and participate in the ceremony, among other things as a declaratory act against the vandals of the monument. "It is possible that the terrorists will watch the event from afar and I appeal to the public to come there and strengthen the families and identify with the bereavement."